FIGURE5 ■ Laparoscopic bladder reconstruction of the large bladder diverticulum containing a stone. In the cystogram on the left, the bladder is the smaller contrast-filled cavity and the stone is filling defect within the diverticulum. Endoluminal assistance was provided by the use of a intravesical flexible cystoscope and a ureteral illuminator. Source: Cook Urologic, Spencer, IN. opening allowed onlay of the xenograft such that two simple suture lines could accomplish the cystoplasty (Fig. 6). Running 4-0 polyglactin sutures synched with intracorpo-real knots allowed the cystoplasties to be water tight with an average time of surgery of 134 minutes. One case of laparoscopically assisted continent catheterizable cutaneous appendicovesicostomy has been accomplished (57). A 15-year-old female with an obliterated bladder neck from multiple previous surgeries underwent mobilization of her appendix laparoscopically utilizing a 12 mm linear cutting stapler. The cecum was reat-tached to the side wall with absorbable sutures tied intracorporeally. The appendix was anastomosed isoperistaltically to the bladder via a trocar passed transvesically. The base of the appendix was delivered through a predetermined stoma site via a 10 to 11 mm trocar and the appendicovesicostomy was finished using the Mitrofannoff principle with a 4 cm subepithelial tunnel through a small open cystotomy. The total operating time was 360 minutes. Finally, Anderson et al. described an animal model for laparoscopic continent urinary diversion in swine (58). In nine male swines, in situ ureterosigmoi-dostomy in a 5 to 6 cm detubularized rectosigmoid pouch was performed. A Boari flap for reconstruction of the distal ureter has been described by several investigators. The first case was done because of distal ureteral involvement by endometriosis (59). A series has been presented by the Johns Hopkins group. There were two left and one right sided distal ureteral obstructions with 6 to 8 cm of distal ureteral involvement. An anterior bladder flap was harvested from the bladder after dividing the superior and middle vesical arteries with the Endo-GIA. The ureter was anastomosed to the flap using interrupted 4-0 polyglactin suture (60). FIGURE6 ■ Laparoscopic augmentation cystoplasty in a canine model. incontinence were being widely performed, but long-term follow-up investigations have failed to adequately deomonstrate that laparoscopic colposuspension maintains continence (64,65). Some centers continue to persist in evaluating the potential for laparoscopy to treat stress urinary incontinence (66). Laparoscopic mesh fixations have been performed for severe pelvic prolapse syndromes in women. The "gold standard" sacrocolpopexy has now been performed laparoscopically. Of the vaginal restorative procedures, uteroscacral ligament vault suspension, iliococcygeous and sacrospinous fixation each have their proponents. There is marked utilization of mesh materials to reconstruct these prolapse syndromes requiring suturing to these anatomic structures. All types of prosthetic mesh materials are being investigated and utilized (67). The urachus is an unusual site for urologic disease, but it too has been successfully approached by laparoscopic maneuvers. Most commonly, urachal sinuses and cysts have been laparoscopically resected and ligated. More common in children, these occasionally present in adulthood. A case of a 34-year-old male underwent a laparoscopic resection of a 4 cm cyst from the urachus using a voice-controlled laparoscope (68). One series of pediatric management of urachal anomalies has been published. Four children ranging in age from 4 to 10 underwent laparoscopic radical excision of the urachus (69). Four adults have also been managed laparoscopically in a report by Cadeddu et al. In these cases the ura-chus, and medial umbilical ligaments were detached just caudal to the umbilicus and dissected caudad to the bladder dome. In three-fourth cases, a bladder cuff was taken with the specimen because of fibrotic attachments. The bladder defect in these cases was sewn in two layers with 2-0 polysorbate loaded on an EndoStitch® device (70). toneum. Neoplastic changes in the lining of diverticula occur in approximately 0% to 13.5% of cases (74-77). Laparoscopic division of a bladder cuff during nephroureterec-tomy and ureterectomy in porcine experiments and humans has been described by Kerbl et al. (78). After cystoscopically incising the ureteral orifice and submucosal tunnel, a 2 cm juxtaureteral bladder cuff is dissected laparoscopically. A linear cutting, mul-tifire stapler is then utilized to close and excise the cuff of bladder (79). Parra was the first to perform a laparoscopic cystectomy in a patient with pyocys-tis. Porcine animal studies have been performed to evaluate methods of cystectomy and urinary diversion. Anderson and Clayman described a method of ureterosigmoidostomy (79). Kaouk et al. presented an animal model of orthotopic ileal neobladder (80). Baldwin described an attempt to simplify the laparoscopic reconstructive effort by using the "dunk" technique for ureteroileal anastomoses. In addition, they used Lapra-Ty suture clipsa to facilitate intracorporeal knotting. Two-thirds of the "dunked" ureters were partially or completely strictured. In addition, the short cut method of knot substitution resulted in Lapra-Ty migration and subsequent urinary obstruction by the foreign body in two animals (81). Now, laparoscopic radical cystoprostatectomy is becoming increasingly performed. Large series are beginning to accrue patients into the laparoscopic group. Simonato recently reported their technique in 10 patients using a five-port technique. The urinary reconstructive aspects included the orthotopic ileal neobladder in six, sigmoid ureterostomies in two, and cutaneous ureterostomy in two. The mean operating room time was 166 minutes (range, 150-180). Two patients have diffuse metastatic disease with eight are free of disease at a mean 12.3 months (range 5-18) (82). Another method has been utilized by Abdel-Hakim et al. Laparoscopic radical cystoprostatectomy was performed in nine patients. Here the authors removed the laparoscopic specimen through a 3 to 5 cm right iliac fossa incision through which a detubularized modified Camey II orthotopic neobladder was performed (83). Matin and Gill from Cleveland have detailed their method of completely intracorporeal urinary diversion following laparoscopic radical cystectomy. Here the authors performed a completely hand-sewn anastomosis of the orthotopic neobladder and the ureteroileal anastomoses (84). They have summarized the application of this technique in two patients using six ports with an average time of 9.5 hours (85). This same group previously published a series of five patients who had undergone a laparoscopic radical cystectomy with ileal conduit urinary diversion using a six-port technique (86). Another group has performed 11 laparoscopic radical cystectomies with intracorporeal construction of a continent urinary diversion (Mainz pouch II). Their average operating time was 6.7 hours (87). Segmental bowel excision and reconstruction using automated staplers has been practiced during open surgery for many years. Bohm et al. described the technique of laparoscopic intestinal resection and intraperitoneal reanastomosis (88). After mobilization of the selected intestinal segment and isolation of the vascular pedicle, the linear cutting stapler is inserted into enterotomies on the antimesenteric border of afferent and efferent limbs of the future anastomosis. Two consecutive firings of the 3 or 6 cm stapler creates a 5 to 11 cm anastomosis. A cotton umbilical tape encircling the bowel close to the anastomosis provides countertraction and prevents spillage of intestinal contents into the peritoneum. Firing the linear stapler across both loops of bowel near the corner of the anastomosis transects the specimen and completes the anastomosis. Kozminski reported the first urologic application of automated stapling for laparoscopic bowel resection and intracorporeal ileal conduit formation (89). His initial clinical case involved performing the palliative supravesical diversion in an 83-year-old male for unresectable fibrosarcoma of the prostate. Intracorporeal ureteral and bowel mobilization was accomplished through six 10 to 12 mm trocars. 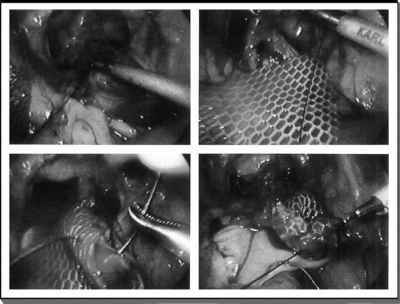 Bowel resection and reanastomosis were performed extracorporeally with linear stapling devices after evacuating the pneumoperi-toneum and pulling the bowel through the 12 mm port site. Once the resected bowel segment was mobilized the mesentery is closed intracorporeally with biting clips and the ureteral anastomoses were accomplished extracorporeally by suturing techniques after mobilizing the ureters. Securing the conduit to the retroperitoneum was again accomplished by biting clips applied intracorporeally. Two subsequent patients have had ileal loop diversion with entirely intracorporeal bowel resections and reanastomosis using these staplers (89). In all three patients, the ureteroileal anastomoses were sutured extracor-poreally. This same technique has been repeated by others (90). Other applications for these techniques would be urologic reconstructions utilizing other gastrointestinal segments. Augmentation cystoplasty can be performed with harvested gastric, small bowel, or large bowel segments. Ureteral interposition or replacement could theoretically be performed. Finally, supravesical diversions with ileal conduits represent only one of many methods of noncontinent and continent heterotopic or orthotopic bladder replacement techniques. Automatic, linear cutting staplers have the potential to make such urologic reconstructions possible. The lithogenic properties of metallic staples used for urinary tract reconstruction are well known. Stone formation attributed to exposed steel staples occurs in 3.2% to 4.2% of patients with ileal conduits and 4.9% to 10% of patients with Kock pouches (91-94). The lithogenic potential of titanium staples exposed to human urine is not known. Kerbl et al. have used a linear titanium stapling device to excise a bladder cuff during nephroureterec-tomy in six adult humans (78). Three patients have been followed more than a year without complication and/or endoscopic evidence of staple exposure. Endoscopic verification of the lack of exposed staples and over sewing the staple line are recommended by some authors. Prototypic automated staplers using dissolvable staples are currently under study. Julian and Ravitch compared stone formation on exposed stainless steel and Polysorb™b absorbable staples used to close the bladder in dogs. Although staple exposure was much higher in bladders closed with absorbable staples (56% vs. 2%), crystal formation more commonly occurred on exposed stainless steel staples (25% vs. 7%) (95). Laparoscopic augmentation cystoplasty has also been investigated. Early efforts attempted to use novel biomaterials such as intestinal submucosa (96). Others have utilized tissue expansion techniques to expand the native ureter and augment the bladder with this laparoscopically (97). The small bowel has been utilized during a transverse hemicystectomy with ileocystoplasty in the porcine model (98). Finally, Siqueria et al. described the synchronous correction of small bladder capacity by laparoscopically augmenting the bladder with ileum, but also performing a continent ileovesicostomy in the porcine model (99). The next step of course was clinical application. The first reported case of laparoscopic ileocystoplasty was Sanchez de Badajoz's case report of a patient with urinary tuberculosis. An isolated segment of ileum was taken using Endo-GIA staplers. The enterocystoplasty was performed with two firing of the Endo-GIA stapler plus the addition of holding sutures (100). Three patients were described by Gill et al. using different bowel segments in each of these cases. The functionally reduced bladder capacities were augmented using the ileum, the sigmoid, and the cecum and proximal ascending colon in these patients (101). 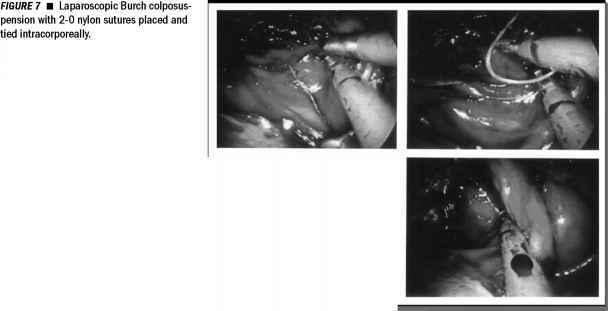 In reporting the application of laparoscopic ileal cystoplasty, Elltiott et al. noted some important technical considerations. Important to this operation included (i) preoperative evaluation of compliance and videourodynamics; (ii) cystoscopic placement of externalized ureteral catheters; (iii) transperitoneal placement of trocars; (iv) identification of the cecum; (v) proximal mobilization of the ileum sufficient for pelvic placement; (vi) measurement of ileal length with segment of precut vessel loop; (vii) vertical cystostomy after incision of the peritoneum and entering the space of Retzius; (viii) ileal division and side-to-side anastomosis using Endo-GIA stapler; (ix) detubularization and freehand intracorporeal suturing into a U-shaped configuration; (x) fixing ileal patch at the 6 and 11 o'clock positions; (xi) completion of ileal-bladder anastomosis in quadrants with running sutures; (xii) irrigation of bladder and placement of a closed suction drain into the pelvis; and (xiii) cystogram at four weeks postoperatively (102). Because of the hazards associated with enterocystoplasty, the search for an ideal substitute continues even in the minimally invasive era. One recent investigation used a variety of different biodegradable grafts in an animal model. Thirty-one minipigs underwent transperitoneal laparoscopic partial cystectomy and augmentation cystoplasty using nothing (six controls), porcine bowel acellular tissue matrix (6), bovine pericardium (6), human placental membranes (6) or porcine small intestinal submucosa (6). All three grafts had only mucosal regeneration at 12 weeks postoperatively and all had contracted to between 60% and 75% of their original sizes (103). The bladder has not only been the target of intense endourologic research interest, but it has finally been reconstructed in a variety of methods. This brings the discussion full circle, as is fitting. Wolf and Taheri have recently reported a laparoscopic undiversion. This was in a 25-year-old man who had undergone an open ileal conduit diversion and colostomy with mucous fistula for a gunshot wound 11 months prior to presentation. The colostomy and mucous fistula were taken down first and an extracorporeal bowel anastomosis was performed. Next laparoscopic trocars were positioned and the bladder dome and abdominal portion of the ileal conduit were mobilized. A single layered ileovesical anastomosis was performed using a 4-0 absorbable suture (104).